Charlie E. Rivers married a daughter of Oliver Loving, who was mortally wounded on the Pecos. Mr. Rivers numbered among the early ranchmen of Palo Pinto, Jack, Young, and adjoining counties. Charlie Rivers had sold his cattle to his brother-in-law, James C. Loving, who was also an early rancher on the northern frontier. W.B. Slaughter, a son of G.W. Slaughter, had been instructed to return from Kansas to Dillingham Prairie, in Jack County, to receive cattle as payment for other cattle, G.W. Slaughter, had sold to Rivers and Loving. So June 16,1871, while Satanta and Big Tree were jailed at Ft. Richardson for the attack made on the Warren train, the Rivers and Loving and Slaughter outfits, under the supervision of W.B. Slaughter, were rounding up cattle on Rock Creek, near Dillingham Prairie, in Little Lost Valley, and elsewhere, for the purpose of making proper transfers. W.B. Slaughter and his assistants, and associated, were camped, when night came, at the corrals on Dillingham Prairie. The Rivers outfit was camped about one-half mile away. The J.C. Loving outfit was camped about three or four hundred yards from Charlie E. Rivers camp. About two o'clock in the morning of June 17, 1871, the Indians charged the Rivers outfit, which was near the creek. Perhaps the savages thought that by charging this camp, they could better accomplish their purpose. They divided into two divisions. One band of Indians stampeded and took charge of the horses. The other charged the camp. This strategic movement proved to be effective, for while the Indians were holding those at bay at camp, it gave the remaining savages an opportunity to drive the horses away. In doing so, they knocked down and painfully wounded Charlie Kinchen, who was guarding the horses at the time. Charlie Kinchen was a cousin of John O. Allen, who was also in the fight. When the Indians charged the camp, a bitter fight was fought shortly after the midnight hours. Charlie E. Rivers stood up near the front of his tent, emptied his six-shooter, and then walked over near the end of his wagon tongue to get his gun. About this time, he was shot through the left lung with a bullet fired from a pistol or rifle. Before the fight John. O. Allen was asleep with his saddle used as a pillow. When the Indians appeared, he grabbed his gun and fired. When he did, a savage shot at the blaze of his weapon, and the bullet knocked off the saddle horn, barely missing John O. Allen, who only a short time before was with Henry Eberson when he was killed. After recovering the horses, the Indians withdrew. The firing alarmed the cowmen in the other camps, so all were in readiness for an attack there. But no further charge was made. W.B. Slaughter and the others who were looking after the Slaughter cattle at the cow-pens, had several fires around to quiet down the wild cattle. But when the shots were heard, they hurriedly extinguished the fires. 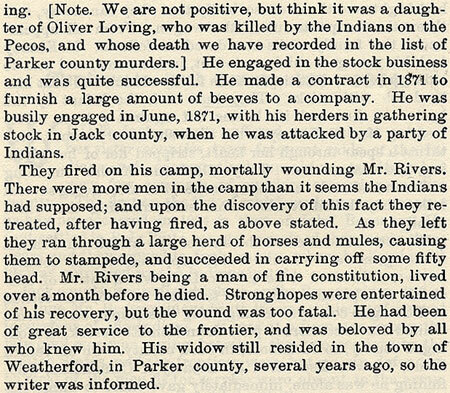 After the fight was over, a runner was sent to the J.C. Loving camp to inform him his brother-in-law, Charlie Rivers, had been seriously wounded. W.B. Slaughter also visited the wounded man. At the time, Charlie E. Rivers told Slaughter that he did not know whether he had been wounded by the Indians or accidently shot by one of his own men. A runner was hastily dispatched to Weatherford for surgeons, and to notify Charlie E. Rivers' family of his serious condition. The next day Fr. W.C. Milliken and Dr. McDermett, and others, carried Rivers to his home in Weatherford, where he lived about six weeks before he died. Note: Author personally interviewed: John O. Allen, whose saddle-horn was shot from the tree of his saddle; W.B. Slaughter, mentioned above; Oliver Loving Jr., son of J.C. Loving; and many other early settlers of Jack, Young, Palo Pinto and Parker Counties. Further Ref. : A manuscript detailing this fight, and furnished the author by W.K. Baylor; and J.C. Loving's own account of the conflict, in the Cattle Industry of Texas, (1895).